After falling behind early in the game, the Sonoma State baseball team came back to tie the CSU East Bay Pioneers 4-4 in the sixth inning at home Saturday, but neither team scored again until the Pioneers took the lead once and for all in the 14th inning. The Seawolves lost the game 4-5, dropping their record to 14-14 in the CCAA. 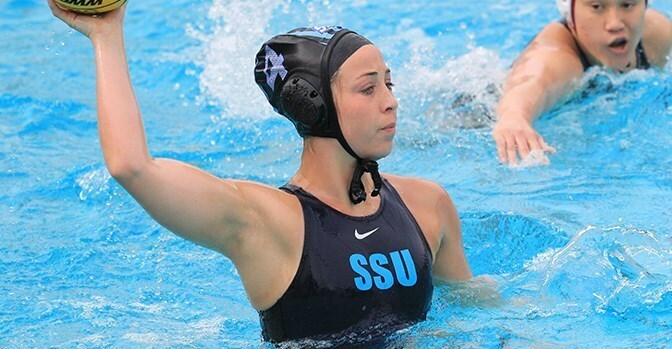 The Sonoma State women's water polo team suffered a pair of losses in Seaside on Saturday, losing 4-10 to UC San Diego before falling 5-9 to host Cal State Monterey Bay several hours later. The Seawolves fell to 7-17 this season. Justin Shluker, Nicolas Daniels and Eric Ash all tied for 12th place on the individual leaderboard with an 11-over-par score of 227, and the Sonoma State men's golf team held on to finish in second place despite strong winds and a furious rally by Chico State in the final round of the 2015 Tim Tierney Pioneer Shootout March 31 at Hiddenbrooke Golf Club in Vallejo. The Sonoma State women's tennis team saw an end to their six-match winning streak on Friday as they stepped out of NCAA Division II competition to take on an old rival, UC Davis. Despite a valiant effort, the Seawolves came up empty, dropping a 0-7 decision to the Aggies. The loss drops the Seawolves to 14-7 on the season. Several Sonoma State women's track and field student-athletes set personal-best times on day one of the Eighth Annual SF State Distance Carnival at Cox Stadium on Friday, including a first-place effort in section nine of the 1500 Meter Run by Abby Utic. The Sonoma State softball team combined for 15 runs and 24 hits in Saturday's doubleheader, but it wouldn't be enough as it lost both games at Cal State Monterey Bay. The Seawolves fell into third place in the CCAA with a record of 15-8, one and a half games ahead of fourth-place Chico State.